The race for pageviews and ad dollars is causing publications to focus on quantity over quality. Coverage is consolidating around attention-grabbing topics, like the latest hot startup or celebrity CEOs. Publications are wasting time writing and regurgitating the same stories again and again. Media outlets are relying on sensational headlines or idle speculation, not original reporting, to make their versions stand out. The Information, launching today, is our first step towards building a publication that operates differently. We’re a team of reporters and editors who have learned from the best in the business, and we want to challenge ourselves to write better articles that break new ground. Period. To do that, we are focusing on writing for readers we think are underserved: professionals in technology and in industries being upended by it. These readers find plenty to read every day but they don’t consistently find news that is relevant to them and their business challenges. They don’t often find news that takes a stand supported by facts. We aim to do both. So, instead of chasing the highest number of eyeballs, we will chase and deliver the most valuable news. We’ve set the bar high. To succeed, we need to write articles that deliver value worth paying for. That’s why we’re a subscription publication. We know this is an ambitious idea given the flood of free content on the market. To succeed we’ll have to do more with less, be ruthlessly focused, be creative and be consistent. Those challenges drive us and make us so excited to be launching today. We would love to hear from you. We have much to do and look forward to adding new features that our subscribers want. For now, we are thrilled you’re here to see what we have been building these past few months and to help us take the next steps. There’s a lot of speculation about why Apple bought motion-sensor company PrimeSense. But I think the real reason has been overlooked. PrimeSense’s chips were in early versions of Microsoft’s Kinect sensor, the gaming console that lets you wave your hands around to control it. So, many have jumped to the conclusion that Apple purchased the company for a component for its long-awaited, long-rumored TV. I don’t think that’s it. Industry sources tell me PrimeSense’s motion-sensing technology for gestural controls is a little bit behind and that Microsoft doesn’t use it in the Kinect. But PrimeSense’s technology is much more strategic for mapping, according to one person familiar with the company. In fact, companies like Matterport, which makes a camera for mapping three-dimensional spaces, use its chips. We know Apple cares about mapping. The company bought WifiSLAM, an indoor GPS company, to help it map out malls and another indoor spaces in a race against Google, which is doing the same. Sooner rather than later, our phones will pull up scans of real spaces we want to visit or may be approaching. Those two-dimensional maps will seem very obsolete. As for the endless anticipation around an Apple television, I continue to hear that the company is more interested in set-top boxes for now and that some early prototypes haven’t had motion technology. Sure, Apple could add that technology over time but I don’t think we should be holding our breath for a device or for one controlled by waving our hands. Apple already sells millions and millions of very handy controllers. They are called iPhones and iPads. An Apple spokeswoman didn’t immediately return a request for comment. One of the most important questions about the future of computing is this: wrist or face? We thought we’d take a look at what consumers today say they would be more willing to buy as a signal of what they’re likely to find more natural. Watches had the clear win. But the largest contingent didn’t want either. 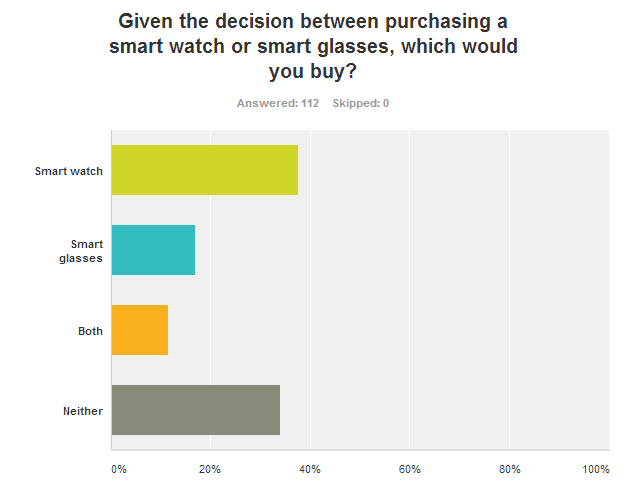 Thirty-eight percent of those surveyed opted for smart watches compared with 10% for smart glasses, according to a survey we commissioned of 417 Americans on SurveyMonkey Audience. Forty-five percent chose neither, while 6% chose both. 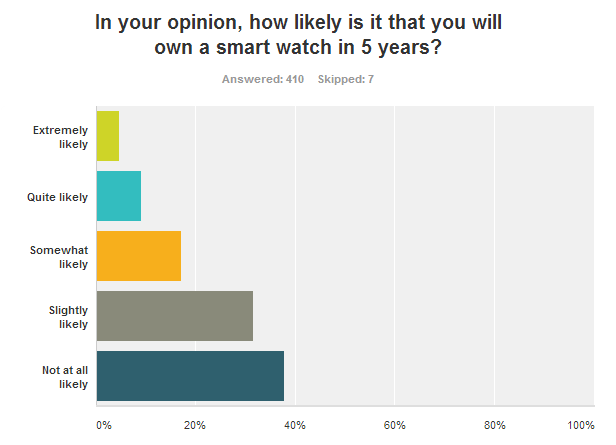 A majority of respondents, 62%, said they thought that it was possible that they would own a smart watch in the next five years. 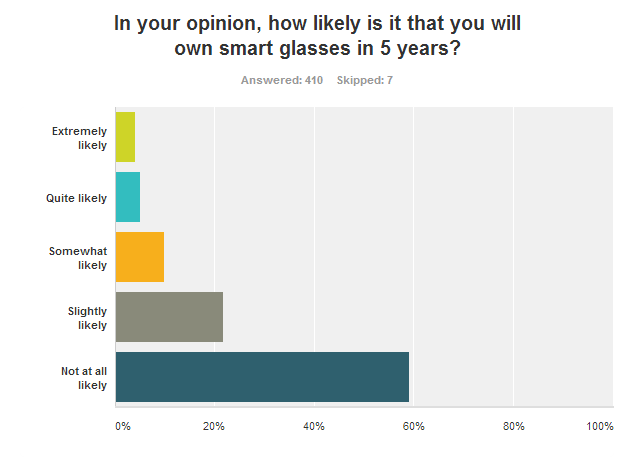 Only 41% of respondents thought it was possible that they would own a smart glass device in the next five years. 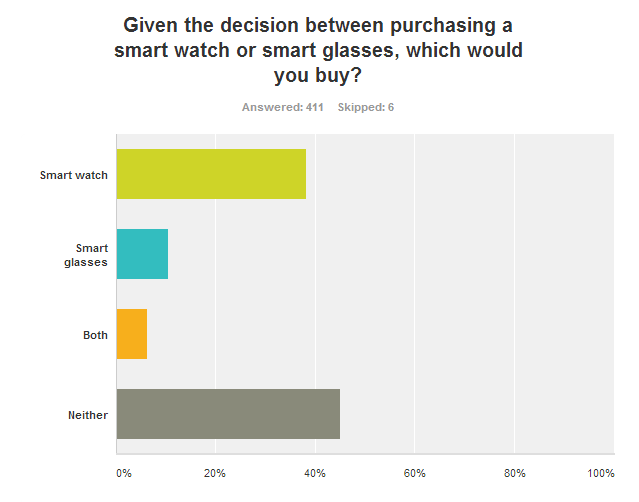 Even among respondents who considered themselves “quite tech savvy” or “extremely tech savvy,” smart watches won out over smart glasses, 38% to 17%, with 12% indicating that they were interested in both. Many app developers and hardware companies are betting that a new generation of wearable devices will create a new hardware market. In 2014, manufacturers are expected to ship 15 million smartwatches and by 2020 that number could reach 373 million, according to emerging markets research firm NextMarket. That admittedly optimistic estimate is based, in part, on the more than 1 billion yearly conventional watch shipments. Consumer surveys, of course, have their limits. Plenty of people were initially skeptical that tablets would upend the PC market, for instance. Attitudes can change once users learn more about the full range of features offered by a new class of hardware. Google Glass beats other search terms, but the smartwatch category ranks higher than smart glass. That’s why many app developers believe that the smartwatch category is still waiting for a truly dominant player like Apple to enter the market. An appealing offering from Apple could further boost interest in a smart watch. For a dose of perspective, check out the same Google Trends graph after we add “iPhone” into the mix. The iPhone, in search as in the physical world, dominates the competition. Our old search terms are barely visible compared to the soaring purple line that represents iPhone searches. Wearables have a long way to go. Another comparison might be fairer to the early days of wearables. 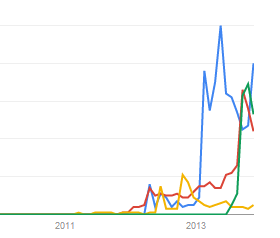 This graph shows first the rise and fall of the Palm Pre (blue) and then the emergence of Google Glass (red). Both had a similar level of interest in their early days, according to Google Trends. The launch of Google Inc.’s Android KitKat, the next version of the most widely used operating software for smartphones and tablets, is drawing near. Google executives haven’t announced a release date but people who have been briefed on KitKat say that it is coming soon. There have been several reports about KitKat’s likely features based on leaked screenshots and leaked photos of the Nexus 5 smartphone that will be the first device to show off those features. But we’ve reviewed a confidential file that Google shared with companies that make Android devices to explain the most important new features. (A Google spokeswoman didn’t respond to requests for comment.) Here’s what we know. One Android to rule them all? With KitKat, Google has worked even harder to address one of Android’s biggest disadvantages versus Apple: less than half of Android devices are running the latest version of the software, called “Jelly Bean,” which was released in summer 2012. Nearly two-thirds of Apple devices already are running the latest version of its iOS software, released last month, the company has said. This Android fragmentation makes it tougher for Android app developers to run the latest versions of their services across all Android devices. Some earlier releases of Android were better suited to higher-end devices that have more memory capacity for all the newest features. As a result, cheaper phone makers sometimes ended up using older versions of Android. The document about KitKat that we reviewed, marked “confidential,” makes clear that Google wants its new software to work well on low-end phones in addition to the more expensive Samsung Galaxy and HTC devices. KitKat “optimizes memory use in every major component” and provides “tools to help developers create memory-efficient applications” for “entry-level devices,” such as those that have 512 megabytes of memory, according to the document. Google has long sought ways to help make the newest versions of Android compatible with low-cost devices, the kind that are proliferating in developing countries with the help of manufacturers like Huawei, ZTE, and others. This time Google has been more proactive with makers of lower-memory devices, said people who have been briefed on that matter. Questions remain about whether the effort will bear fruit. In many markets, wireless carriers don’t do a good job of pushing software upgrades to existing Android devices that already have been sold. The improvements for low-memory devices also could help the software to better power wearable-computing devices. The KitKat release shows that Google is preparing for the rise of wearable-computing devices. According to the confidential document, KitKat is expected to support three new types of sensors: geomagnetic rotation vector, step detector and step counter. These features are likely geared for forthcoming Android-powered smartwatch made by Google and possibly the company’s head-mounted Google Glass, as well as non-Google devices. Android smartphone apps that track people’s fitness also could get a boost from the new feature as more manufacturers pack motion sensors into devices. There is another potential benefit to Android from supporting these kinds of sensors: Google will be able to tell how far someone walked based on the steps they took. That could come in handy as Google tries to map more indoor locations such as malls and airports, where GPS and WiFi sensors don’t always do a good enough job of pinpointing exactly where a smartphone user is located. It also could improve the walking directions that people use on Google Maps. KitKat will allow developers to create services to allow phones to “emulate” physical cards that let people make payments, earn loyalty rewards, enter secure buildings and public-transit system, according to the confidential document. But it’s unclear whether the change will spur growth in the area. Google has been a huge proponent of Near-Field Communication technology, which allows phones to exchange data with other devices over distances of a few inches. The technology enables people to pay for things at stores with their phones, among other users. But the technology hasn’t gotten much adoption from app developers, nor has Apple embedded it in the iPhone. On Android, adoption was slowed in part because developers couldn’t create apps that emulated what physical cards do in the real world without first getting permission from wireless carriers, says Einar Rosenberg, chief executive of Creating Revolutions, which makes NFC-based apps. That’s because carriers control a part of the phone called the “secure element” where a card owner’s personal information is stored. According to the KitKat marketing materials, developers will be able to emulate cards without keeping people’s information stored in the secure element. The biggest question mark about the feature is where the personal information will be stored without running the risk of getting manipulated or stolen by hackers, Mr. Rosenberg says. Google wants your Android device to be a remote control. The next version of Android lets developers build apps that control TVs, tuners, switches and other devices by sending infrared signals. Samsung and HTC devices already have built-in infrared “blasters” and both companies used a company called Peel to design an app that can control TVs. But KitKat will help developers avoid having to write different apps for different hardware makers because there will now be a standard way for all apps to tell the Android device to activate the blasters. Google wants Android apps to be able to interact with a wide variety of devices using Bluetooth technology. Those devices include joysticks, keyboards, and in-car entertainment systems. In KitKat, new support for something called Bluetooth HID over GATT and Bluetooth Message Access Profile will allow Android to talk to more devices than before. We have oodles more details about Android KitKat but much of it is too technical to describe here. Find me on Twitter or Google+ if you have questions about features that will be included in the release. Venture capitalists should pay attention to a development brewing in the medical world. The Children’s Hospital of Philadelphia last week funded a new gene therapy business called Spark Therapeutics. The move was notable because it’s unusual for a research institution to launch a promising biotech company and to cut venture capital firms out of the process. While the hospital’s $50 million investment is a one-off deal, it could herald a world where well-funded institutions find creative ways to grow without VC money. It comes as other research centers, like Stanford University, also have been getting into the for-profit game. The Children’s Hospital is investing in gene research just as the overall biotech investment landscape is shifting. Venture funding in that sector peaked near $6 billion in 2007, bottomed out in 2009 and 2010, and then began a slow march upward, hitting about $5 billion in 2011, according to data from BIO, the Biotechnology Industry Organization. After sliding a bit, investment is on track to hover between $4 billion and $5 billion this year. The Children’s Hospital isn’t just another institution allocating endowment money to a VC firm’s biotech vehicle. The hospital didn’t even co-invest alongside an investment fund, a practice that has become increasingly common as limited partners, particularly private equity LPs, seek bigger returns and more favorable fee structures. Rather, it bootstrapped a for-profit company, a move that Travis Blaschek-Miller, a spokesman with the life science association Bay Bio, says is highly unusual. The story of Spark, in a nutshell, goes like this: About a decade ago, Katherine High, a doctor, clinician, scientist, and adviser to many gene therapy start-ups, convinced the Children’s Hospital of Philadelphia to help fill a research void. Her field had been promising. Throughout the 1990s, scientists had explored the idea of treating damaged genes, which often cause diseases, rather than treating the illnesses caused by flawed genes. The new approach was often referred to as “gene therapy.” But when a teenage boy died in 1999 due to complications related to an experimental treatment, VC money dried up and companies closed down. The hospital supported a cellular and molecular therapeutic research unit with research funds. The work yielded a potential cure for a rare form of inherited blindness. To get the treatment through clinical trials and, hopefully, to obtain Food and Drug Administration approval, Ms. High’s team would need a serious capital injection. It seemed likely that they would travel a well-worn path—seek early stage funding, spin out from the hospital, and effectively give up the biggest piece of the equity and the potential upside. But in a move announced last Tuesday, the hospital used money that would normally have gone toward research to form Spark around the work done by Ms. High’s team. “Now the hospital and the researchers are in a position to retain the biggest slice of the enterprise value pie,” says Spark chief executive Jeffrey Marrazzo. He adds that academic organizations and research hospitals usually license their work to other companies and get low-single-digit royalty rates. The gene therapy for blindness is in Phase 3, the final phase of trials before FDA approval. It’s vying to be the first-ever FDA-approved gene treatment. The enterprise value could be big. Not every research center will be able to follow Spark’s lead, since many hospitals and foundations don’t have the same money and flexibility as the Children’s Hospital. But Spark is a notable case study for well-capitalized institutions. Venture firms are patient money to a point, but they made their priorities clear in the late 1990s and early 2000s by leaving the gene therapy sector. For Spark, the hospital is a financial partner with a shared mission that will hopefully be around longer than early-stage investors. “The Children’s Hospital, which has existed for hundreds of years, is not going anywhere,” Mr. Marrazzo says. Inasmuch as the Children’s Hospital seeks to reap financial benefits from homegrown talent, the Spark investment resembles Stanford University’s decision to invest in tech companies developed by the school’s students. But there are two important differences. Stanford uses endowment funds, whereas the Children’s Hospital essentially owns a for-profit company. And Stanford, which says it has deployed millions of dollars over the past couple of months via the Stanford-StartX Fund, is always a follow-on investor in companies that have already raised financing rounds. The hospital, by contrast, has bypassed venture capitalists entirely for now. It appears to be a good time for the Children’s Hospital to make this bet. The public markets are embracing biotechnology. The NASDAQ biotech index has nearly tripled since 2009. There have been 35 initial public offerings in the sector this year, including gene therapy company BlueBird Bio. BIO reports that those stocks have posted a median gain of 56%. Of the companies that held IPOs, five were working on drugs that were in pre-clinical or Phase 1 testing, showing investors’ willingness to take more risks. “VCs are getting a liquidity event even if their companies haven’t sold a product,” says Mr. Marrazzo. “The public markets have helped get venture capital money back into gene therapy and other biotech companies,” he says. As investors look for opportunities in sectors like medicine, it’s good to see a hospital have the confidence and resources to bet big on its own product. If the Children’s Hospital’s investment pays off, it will be a lesson to other players in the field that they don’t have to cede all the upside to the financial professionals. When Japanese telecom company SoftBank Corp. announced two big acquisitions last week – a $1.5 billion deal for Finnish game maker Supercell on Oct. 15 and a $1.3 billion deal for hardware distributor Brightstar on Oct. 18 – it seemed like just another tech giant shopping around for ways to diversify and grow. But SoftBank is no ordinary company when it comes to M&A. The latest moves of its CEO Masayoshi Son show that the company is looking for ways to become a force in mobile content, an interest that could someday spark a corporate makeover. Over the past three decades Mr. Son has used acquisitions to anticipate secular changes in the tech industry, a pattern that is evident in the company’s annual reports, executive letters, and earnings results. The architect of SoftBank’s M&A and investment strategy, Ronald Fisher, did not return calls for this story, but company documents show how investments have spurred prescient shifts in corporate strategy and big changes to the core business. SoftBank is currently the world’s third largest wireless carrier, but that has not always been the case. Mr. Son has transformed his company about every decade thanks to acquisitions that were, at first, ancillary to the core business. In the mid-1990s, the company was a publishing company. By the mid-2000s, it was an Internet powerhouse. “Through investing in information industry-related businesses we gather intelligence about transformative opportunities and new future trends,” Mr. Son wrote in the latest annual report. It’s not common to see a corporation constantly reinvent itself, but those that do so successfully are among the world’s best, most exciting businesses. General Electric was once a light bulb maker and now it’s one of the country’s largest issuers of consumer credit. IBM made typewriters and now it runs data analytics for large companies. A few much younger companies are trying to be chameleons, too. Amazon is still an online merchant, but it’s making big bets on digital media and hardware. Google is still a search company, but it is also a serious software maker. Before we consider what Supercell and Brightstar could mean for SoftBank, it’s important to understand how acquisitions have led to corporate change. SoftBank was established in 1981 as a PC software distributor in Japan. In order to expand into the United States, Mr. Son bought PC trade show operator COMDEX in 1994, and technology trade magazine publisher Ziff-Davis in 1995. The deals got SoftBank into the U.S., and put the company squarely in the flow of information about emerging technology companies. Information from COMDEX and Ziff-Davis convinced Mr. Son that the Internet, not hardware, would fundamentally change technology. The CEO of Ziff-Davis arranged for Mr. Son to meet with Yahoo founders Jerry Yang and David Filo, and in 1996 SoftBank became Yahoo’s largest shareholder and got a controlling stake in the new venture Yahoo Japan. By 1998 SoftBank was a media company. Publishing and events accounted for about 71% of income. Yahoo Japan and investments in online properties like E*Trade and GeoCities led Mr. Son to believe that everyone would someday be online. So he invested in broadband and fixed-line telecom companies from 2000 through the middle of the decade, in anticipation of a need for high-speed connectivity. By the mid-2000s, SoftBank was an Internet company with nearly all of its operating income coming from Yahoo Japan, online commerce sites, and online advertising. At the same time it was using acquisitions to become a telecom company with a presence in mobile. The media division barely registered in terms of revenue or income. This history brings us to the SoftBank of today, a wireless operator that became a global player when it completed a $21.6 billion acquisition of Sprint this June. The company generates 64% of revenue and 62% of earnings from the mobile communications business. Last week’s deal for Brightstar — a device middle man between hardware makers, retailers, and wireless companies — could increase SoftBank’s influence with manufacturers by combining the purchasing powers of SoftBank and Brightstar. That’s a good position to be in given that a lot of consumers (and, presumably many SoftBank wireless customers) are hunting for phones. Research firm eMarketer says only 20% of the world currently uses smart phones. But the Supercell deal shows that SoftBank is preparing for a future where wireless may not dominate the company’s financial picture. Marc Einstein, a consultant with Frost & Sullivan, said the deal illustrated that “mobile operators need to be more forward looking.” He predicted that revenues from mobile services will fall in the next four or five years. Supercell strengthens SoftBank’s subsidiary GungHo, a company that began as an online auction site and morphed into a game maker several years ago. GungHo makes one of the world’s best selling mobile games “Puzzle & Dragons.” The app generates more than $3 million a day, according to Macquarie analyst David Gibson, and has been popular in Japan. Now GungHo can reach players in Europe, where Supercell’s games “Clash of Clans” and “Hay Day” are among the most popular. “Games are a way to access growth,” says Andrew Hawn, who works at the consulting firm the Futures Company. Citing data from eMarketer, he says about 40% of mobile device users will play games on their devices this year, a number expected to hit nearly 60% in four years. SoftBank’s VC funds have invested in lots of companies that — like Supercell and GungHo — reach consumers through mobile devices. Familiar names include Gilt Group, RebelMouse, Mobile Day, FitBit, and Paper.Li. There are also lots of media companies in the portfolio like BuzzFeed, the Huffington Post, Rap Genius, and Now This News. While other VC investors in these companies are hoping for big returns, SoftBank is also using information from these investments to figure what kind of company it will become next. With the Sprint deal so recent, it’s hard to imagine a world where wireless is no longer SoftBank’s most important business. Supercell doesn’t necessarily mean that SoftBank will be the next Nintendo (though we shouldn’t rule it out). But it does show that Mr. Son is trying to figure out how consumer adoption of mobile content will change his company, even though the world simply sees him as the operator of a global wireless powerhouse. For those who want to understand the next phase of tech and anticipate SoftBank’s next core business, keep an eye on the company’s acquisitions. They’ll do much more than just support a wireless giant. I’ve uncovered a few timely nuggets about Apple lately, and I thought I would just spit them out and get you the information. Apple’s new retail chief Angela Ahrendts is a watch lady, say people who know her. I am certainly not implying that Apple, which is developing the iWatch, nabbed this high-profile executive because she loves watches or because one of her most recent additions to the Burberry line was a very high-end watch brand (both true). I also hear she took particular interest in the watch retailing space in Burberry stores. Let’s just say her passion for watches is a coincidence. Or maybe just a plus. Needless to say the merchandising around the iWatch, whenever it arrives, will be remarkable. How Low Can the iPhone 5C Go? Apple CEO Tim Cook and other Apple executives have been hinting in conversations with analysts and investors that the company could discount the less-expensive iPhone 5C over time. Specifically, they have referred to some “behind the curtain” ways to do so before a new model comes out, according to people who have talked to the executives. Why does this matter? Investors are particularly eager to see how Apple plays with pricing now that it has splintered the iPhone line. Remember when everyone was worried because the iPhone 5C wasn’t cheap enough take off in China? It is still far from affordable in developing countries, but clearly Apple isn’t afraid to drop the price and is signaling, in its own subtle way, that it may do so. As an aside, I have been watching Walmart, Target and others slash the price of the iPhone 5C to as low as $49 with wireless contract in recent days. That’s $50 less than Apple sells the device for and an unusually steep discount for the unabashedly luxury Apple. I was wondering if that’s a bad sign for Apple, signaling weak demand. My strong hunch is that retailers are discounting themselves to drive store traffic. Pricing in Apple’s country-specific online stores is steady, according to Piper Jaffray. If Apple starts charging retailers less, we’ll probably see some pricing changes in the online stores. An Apple spokeswoman didn’t get back to me for comment.